Driftwood Bistro is a unique casual “low country” restaurant experience in a relaxed yet sophisticated island resort atmosphere. Let us treat you to the best food and service on beautiful Jekyll Island. Our menu is updated regularly and includes a broad variety of Southern themed options, including mouthwatering fresh seafood, chicken, beef, salads and sandwiches. We offer unique menu specials nightly so be sure to show up early as they have been known to sell out fast. We are one of the most popular restaurants on the island and are known to locals and visitors as that place you’ll want to come back to again and again! Inside the restaurant expect a genuine southern beach atmosphere amidst a mixture of local and regional arts and crafts work that is available for purchase to include our popular collection of carved driftwood fish. We also offer a full service bar and extensive craft beer and wine lists to complement your meal. Our friendly staff is eager to serve you! After your meal, we highly recommend taking a walk down the boardwalk to enjoy the peaceful Jekyll Island beach that attracts visitors from all over the US and abroad. We’ve been told that a stroll there does wonders for the soul. 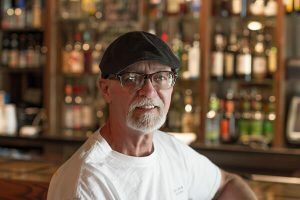 Dan Dickerson has spent his life developing and operating restaurants. He spent time in Atlanta developing and launching Rio Bravo Cantina then moved on to work with a colorful variety of entrepreneurs and restaurateurs. He strives to provide an outstanding and affordable dining experience to each and every guest. Operationally he leverages his Army experience to instill discipline and a clean process throughout his restaurants. The Driftwood concept is a very successful example of the results of his leadership and vision. It is designed to be repeatable anywhere in the US, to learn more please contact Dan directly.